These days, the risk of developing Alzheimer’s is a big concern for Baby-Boomers. But did you know that there’s another common form of dementia called “vascular dementia”? Now, this type of dementia is different from Alzheimer’s disease. In Alzheimer’s we tend to see a large number of alterations in the brain. Amyloid plaques and tangles of tau are the hallmarks of this disease. Nerve damage and brain shrinkage often accompany these changes. Vascular dementia, on the other hand, is caused by a reduced supply of blood to the brain. Without this constant supply of blood, the brain literally starves to death and cells start dying. It’s even possible to have both forms of dementia at the same time. In fact, somewhere around half of patients diagnosed with Alzheimer’s actually turn out to have vascular dementia, too. Here’s the thing. Alzheimer’s is the number one cause of dementia today. It’s the form most of my patients, friends and acquaintances ask me about. But it’s pretty uncommon for folks to consciously engage me in a conversation about vascular dementia. It’s something they just don’t hear that much about, even though it’s the second leading cause of dementia here in the U.S. So I think it’s about time we give vascular dementia a serious discussion. When it comes to your risk of vascular dementia, there’s one factor that really stands out. It’s something so common that affects about 70 million American adults. And you may be one of them. It’s the health of your blood vessels and the ability of blood to surge through them. 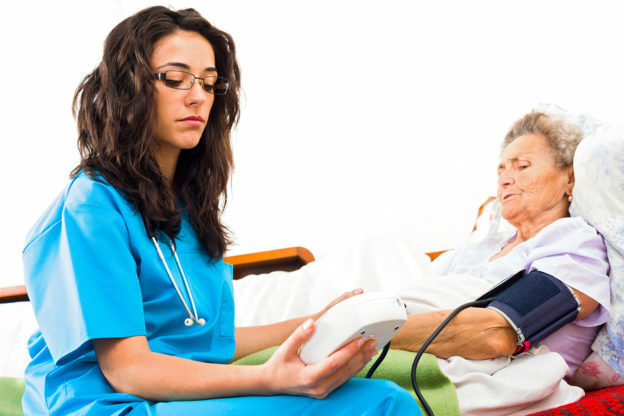 In particular, one out of three adults here in the U.S. has high blood pressure. And if you’re the person with the #1 on your back, your risk of vascular dementia soars, especially in middle-age. That’s because uncontrolled high blood pressure causes damage and narrowing of your blood vessels – including the ones in your brain. This means your brain may not be able to get the continuous supply of oxygen and glucose it needs to function. This, in turn, leads to decreased brain activity that can affect your memory, thinking skills and ability to communicate. If this concerns you, then I’d say it’s time to gain control of your blood pressure. And if I were you, I’d do it as soon a possible. Some of the things that cause high blood pressure are glaringly obvious. Being overweight is one. Eating an unhealthy diet and remaining physically inactive are two more. Consuming too much salt and being a dedicated smoker can also be added to the list. Any doctor will warn you about these factors. But he’ll probably hand you a prescription for a blood-pressure-lowering med while he recites them. Those medications are a crutch. They tend to make you feel like you can get positive results without working for it. But don’t be fooled. All these drugs do is mask symptoms. And as I’ve often mentioned, the side effects from these meds can lead you straight down the road to even more cardiovascular problems. So unless you’re looking forward to spending your later years lost in a haze of dementia, now is the time to start eating a healthy diet. I always recommend getting 87% of your food from organic, plant-based sources and 13% from clean animal proteins. It’s also time to start exercising, drop those extra pounds and give up a few unhealthy habits. There are also certain nutrients that can help slash your blood pressure and protect those all-important blood vessels in your brain. Just 250 ml of beetroot juice each day can lower your blood pressure by about 8/4 mmHg (8 points on the top number, 4 points on the bottom number). It also reduces arterial stiffness and thickening of the arteries. Aged garlic extract (600 mg daily) acts like the beta blocker atenolol to lower blood pressure. Plus, it cuts down on plaque build up in your arteries and improves circulation. Take 4,000 mg of omega-3 fatty acids daily to lower blood pressure, triglycerides, slow plaque build-up and cut your risk of dementia in half. You’ll get the added benefit of extending your telomeres, which helps slow down cellular aging. In addition to protecting you from vascular dementia, all of these changes can also help ward off Alzheimer’s disease. This gives you solid protection from the two leading causes of dementia in the U.S. today. Ashraf R, et al. Effects of Allium sativum (Garlic) on systolic and diastolic blood pressure in patients with essential hypertension. Pak J Pharm Sci. 2013 Sep;26(5):859-63. Johnson EJ, et al. Potential role of dietary n-3 fatty acids in the prevention of dementia and macular degeneration. Am J Clin Nutr. 2006 Jun;83(6 Suppl):1494S-1498S. This entry was posted in Heart Health and tagged blood pressure and vascular dementia, does red beet juice lower blood pressure, is dementia caused by high blood pressure, what is the difference between alzheimer’s and vascular dementa on June 20, 2016 by Taylor Donnini.